SPENCER, Mass. -- For more than a century, Catholic Cistercian monks known as Trappists have been brewing and selling what many beer lovers consider some of the best in the world. Eight monasteries - six in Belgium and one each in Holland and Austria - produce the only beer recognized by the International Trappist Association as authentic Trappist beer. And starting Thursday, the 63 brothers of St. Joseph's Abbey - about an hour's drive west of Boston - will join them, selling the first Trappist beer brewed outside Europe. The journey from jams to beer started almost five years ago when St. Joseph's sent two monks on a fact-finding mission to the Belgian Beer Fest in Boston. Within hours, their European brothers were alarmed to learn of the inquiries. "The original skepticism was because we were outside of Europe ... and Americans," said Father Isaac Keeley, the bald, jovial former potter who has been at St. Joseph's for 35 years and now directs the brewing. "And the fear we would go too big too fast." Keeley and another monk from St. Joseph's packed up and moved to Belgium in December 2010 to see how their European brothers brew - and to convince them that they could properly produce an American Trappist beer. The European monks weren't the only ones who needed convincing. Back at St. Joseph's, a robust debate among the brothers was under way. Some were concerned about starting what would be the most expensive enterprise ever undertaken by the abbey. But everyone agreed the aging monastery buildings were getting increasingly expensive to maintain. In the end, more than 85 percent of the American brothers voted for the project. "We see it as a 50-100 year project. (Just) as we're standing on the shoulders of those who came before us and built these building and supported the way of life, hopefully future generations will be able to stand on our shoulders, what we are doing - and we see the brewery as part of that," said Father Damian Carr, head of St. Joseph's Abbey. The European monasteries made three strong recommendations: To brew beer of Trappist quality they must build a state-of-the-art brewery, hire a skilled brewing engineer, and brew just one kind of beer for the first five years. 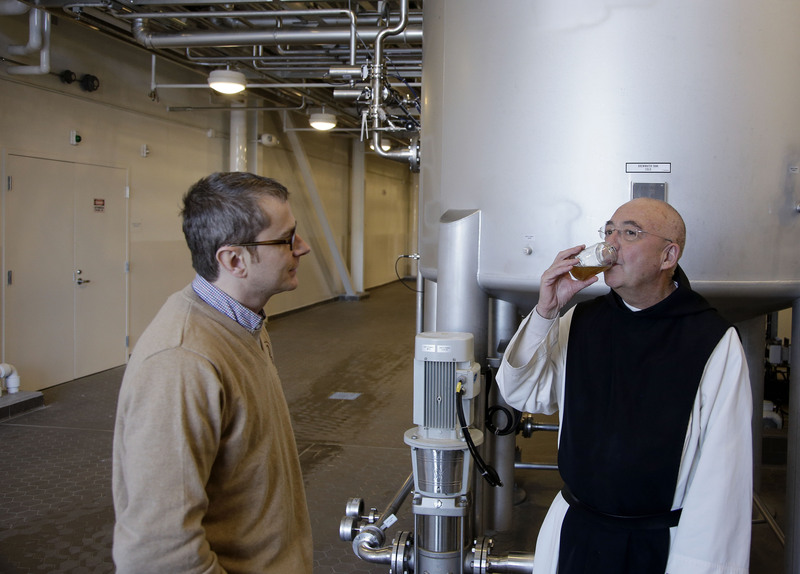 The St. Joseph's monks set to work and built a multi-million-dollar brewery that would be the envy of almost any microbrewery in the world. Securing their bank loan - an amount they won't disclose - was made easier by the success of the monks' previous business venture, "Trappist Preserves." The European brewers, wanting a beer that wouldn't damage the Trappist brand, agreed to help the Americans develop a good recipe. After more than 20 trial batches, the monks in Massachusetts settled on the recipe for what would become Spencer Trappist Ale, a "refectory ale" of 6.5 percent alcohol. The cloudy, golden beer is all-American yet rooted in European tradition with sweet, yeasty notes familiar to fans of other Trappist ales. With beer in his suitcase, Keeley flew last month to Belgium, seeking his brother monks' blessing. He first delivered a PowerPoint presentation on the new brewery, then poured glasses of Spencer Trappist Ale for his European counterparts. "They approved it unanimously," he said, "and after the vote there was applause." On New Year's Day, at their annual holiday party, the brewery team tapped a keg of the final product for the whole St. Joseph's community - the first time many of the brothers tasted the beer that will soon be synonymous with their monastery. "The keg was pouring beautifully. We had this great head on the beer," he said. "The monks were coming back for seconds at least. And it just struck me ... in a certain sense we have made it."